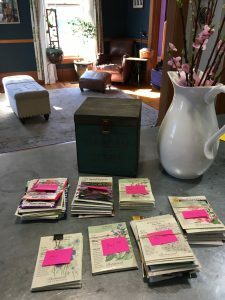 I’m planning to start seeds this weekend — it’s the first time I’ve done this in a systematic way, as opposed to just tossing a few random morning glory seeds in the ground and hoping. Some will be started indoors in trays (with light and heat), some (lettuce-type things) will be sown outside now, and some will be sown outside in two weeks, four weeks, six weeks, eight weeks, and ten weeks. Because that’s what the little packets say to do (you find out what your last frost date is in your area — it’s May 31st here — and then count from there when it says 4 weeks before last frost, etc. ), and I am I nothing if not obedient. I may have gone a little overboard buying seed packets, though. They’re just so cheap compared to buying actual plants. Kid in a candy store.